Kakarakaya ( Bitter Gourd in English, Pavakkai in Tamil, Karela in Hindi) is a very healthy and diabetic friendly vegetable. I make bitter gourd recipes at least once in a week.Usually I prepare bitter gourd curry, Chettinad puli kuzhambu or Pavakkai pitlai. 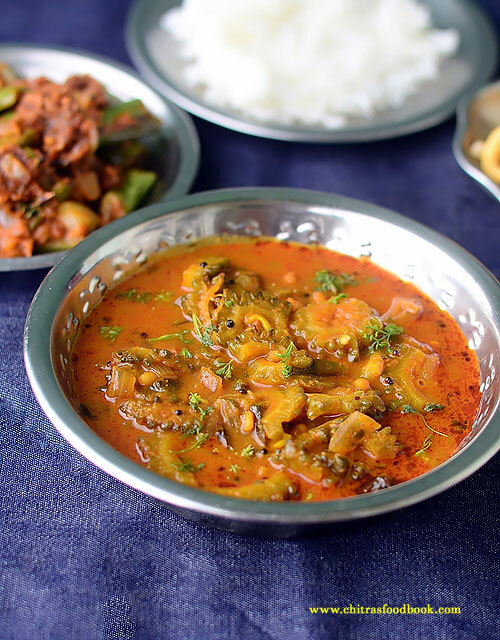 Kakarakaya Pulusu is Andhra style bittergourd gravy made by frying bitter gourd pieces in oil and its added to a spicy gravy. 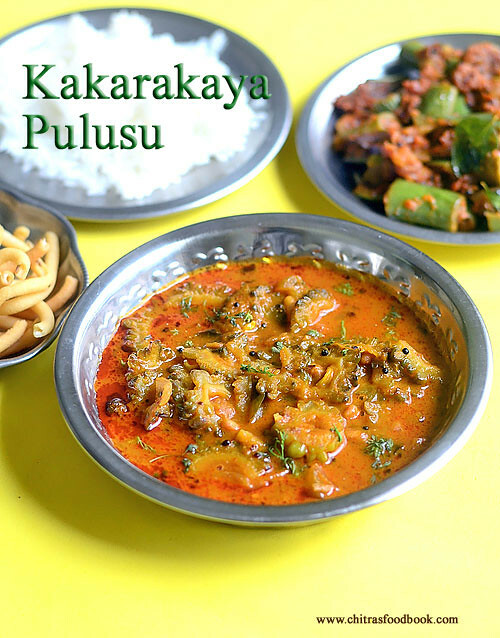 But I came across an easy, one pot, Andhra style Kakarakaya Pulusu ( Pulusu means Kuzhambu/Gravy in Telugu) in a Youtube video. I tried it for lunch along with brinjal masala poriyal. It tasted very well without much bitterness. Bitter gourd lovers like me must try this recipe. Addition of jaggery(Bellam), tamarind and thinly sliced bitter gourd sauted in oil helps to reduce the bitterness I feel. So friends, do try this Andhra special Kakarakaya Pulusu recipe for rice. I am sure you will enjoy it Now lets see how to make it with step by step photos ! 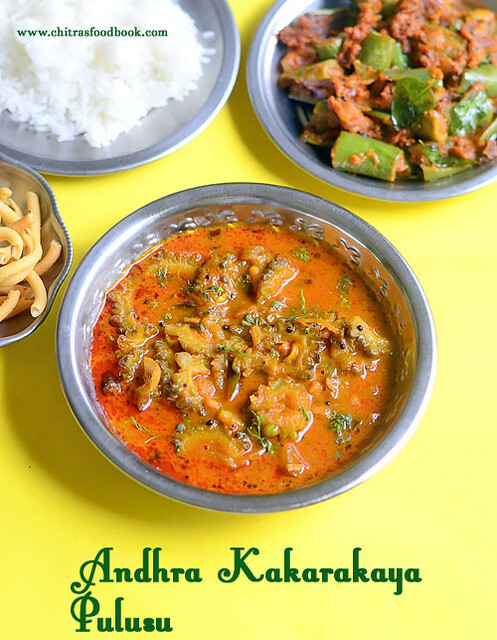 Check out my other ANDHRA RECIPES as well. 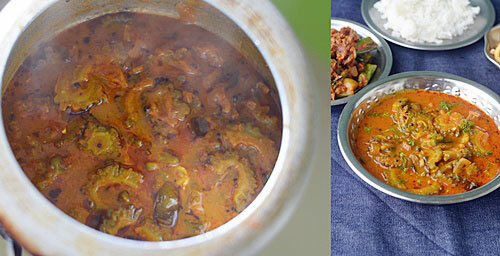 Check out my green brinjal curry recipe in the picture if interested. Wash and cut the bitter gourd vertically. Remove the middle portion along with the seeds. Slice it thinly as shown in the picture below. These steps will help you to remove the bitterness to a certain extent.So slice it thinly. In a pressure cooker base, heat oil and splutter mustard seeds, urad dal, cumin seeds, curry leaves. Add bitter gourd slices, saute till it becomes soft. Add onion, gg paste and saute till its raw smell goes off. Add slit green chillies and saute for few seconds. Bitter gourd turns dark green in color. Now add the red chilli powder, turmeric powder, dhania powder and salt. Dhania powder helps to give thickness to the gravy. Mix well in low flame without burning them. Now add 1 cup of tamarind extract, raw pinched curry leaves. Let it boil for a minute. Add the grated jaggery, check for salt and spice. Add more chilli powder and salt if needed. Mix well and pressure cook in very low flame for 2 whistles. Bitter gourd cooks soft. Add the mentioned quantity of oil to get the oil floating on top. Try this Andhra delicacy at home and enjoy your lunch ! !